The University’s Eating Allergy-Safe and Yummy (EASY) club hosted a meet-and-greet on Friday, Oct. 2 in the Usdan Marketplace. 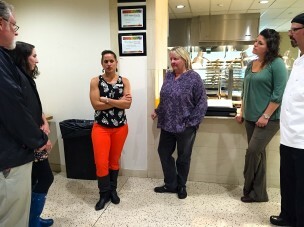 This informal meeting was meant to introduce students with dietary restrictions to faculty, who could help students find easy solutions to their food consumption needs. The staff at the meet-and-greet included Michelle Meyers-Brown, Director of Usdan University Center; Michael Strumpf, Bon Appétit Resident District Manager; and Danielle Rossner, Bon Appétit dietitian. University staff members say Wesleyan does everything in its power to ensure that students with dietary needs are eating safely. Most students with severe allergies maintain close communication with Usdan staff members. Because there are not set recipes for the food that is cooked in the kitchen, it is not always feasible to provide full ingredient lists in front of the food. At the moment, the University is serving as a test site for a food allergy research association. There is a working guidebook with recommendations for colleges working with students affected by allergies. EASY first started as a group called Students at Wes Avoiding Gluten (SWAG), which later turned into gfreeWes. Rachel Sobelsohn ’17 created the club last year to facilitate her meeting other students with Celiac disease. Before SWAG, there was no official community for people with dietary restrictions. As a first-year student, Sobelsohn found a Wesleying article offering advice about eating gluten-free on and off campus, but she was still getting sick in Usdan and WesWings due to cross-contamination. After a meeting with her class dean, the head of Bon Appetit, the head of Usdan, and a doctor from Davison Health Center, Sobelsohn created the club now known as EASY. One of EASY’s main activities is cooking together. Not only do club members get to enjoy a communal meal—one that they can all eat—but many have actually improved their culinary skills. “To my delight, even when we are avoiding more foods, the meals and desserts stayed consistently good,” Sobelsohn said. Although the club mainly targets students with allergies, anyone is welcome to join. Going forward, EASY hopes to provide students with food restrictions on campus with readily accessible resources.